Our technology is driven by the end user’s need to gain better financial transparency and freedom. But it’s not just the customer that benefits. Account aggregation helps everyone – from giving businesses and banks the ability to deliver a more personalised and smooth service, to empowering the end user with a clearer understanding of their finances. Our high-quality account information services (AIS) is delivered reliably in real time from across Europe – without relying on vulnerable techniques such as screen-scraping. It means that you can have the highest confidence in the compliance and quality of the data we provide. We aggregate and enrich data – both existing and third-party – to provide the broadest set that includes both PSD2 and non-PSD2 data. In the new open banking world, using Tink’s account aggregation enables the digital transformation of sales, helping businesses develop complete customer experiences and optimise core processes through digitalisation. 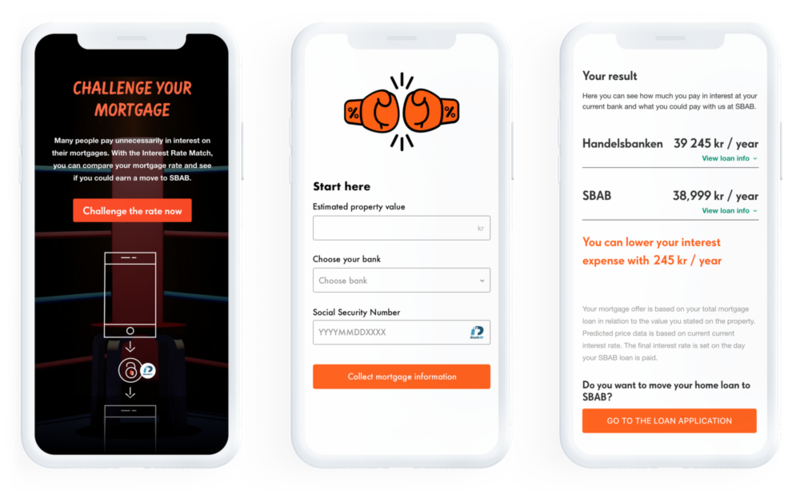 Using Tink’s account aggregation technology to instantly collect users’ existing mortgage information from their banks, SBAB is offering well-informed and competitive offers. Eight out of 10 receive a better mortgage rate. Connect to over 2,500 banks today with our aggregation capabilities. Currently live in 10 markets, we are quickly expanding our connectivity to cover all of Europe by the end of 2019. Need more advice on options for your business? Get in touch and we’ll help you find out how Tink can create a solution tailored just for you.